Why should you purchase the best sit on top kayak? Why not sit inside kayak? Here is the hack: Sit-on-top kayaks are user-friendly, easy to access, not suffocating and drain properly through scupper holes. But the disadvantage of sit on top kayak is that they are not able to keep you dry for long. On the other hand, sit inside kayaks will guard your lower body against water and wind in the price of freedom. Sit inside Kayak offers a limited amount of legroom; as a result, leg cramp is a common issue among the user of this type. Sit inside kayaks are ideal in cold weather but for regular use Sit on Top Kayaks are the best of all. If you love kayaking on a calm day on a beach, a river, a lake or any other flat water areas, Sit on Top Kayak is the right investment. They are ideal for a wildlife photographer, fisherman, diver, explorer and for a swimmer who needs quick in and out escape from their position. If you want to pursue your passion, a sit On-Top Kayak will be your answer. It’s not easy to choose the proper sit on top kayak without making any mistake. The market has a wide variety of products, enough to confuse one. If you need the right one, you have to research a lot which is time-consuming and requires effort. The Vibe Kayaks is one of the leading names in Kayak industry. They have been creating and selling quality kayaks since the beginning. The Vibe Kayak Sea Ghost 110 Sit on Top Kayak is one of the epitomes of their remarkable quality. The Sea Ghost 110 is ideal for both fishing and sports with its standard size. 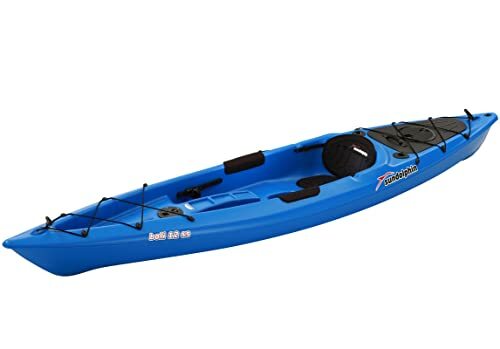 It is rich with all the features and functions required for a fishing kayak but in a shorter format that makes it a sporting option as well. The construction quality of the kayak is incredible with high-quality materials. Durability is not an issue for the Sea Ghost 110. The seating position is ideal and comfortable that makes it easier to control as well. 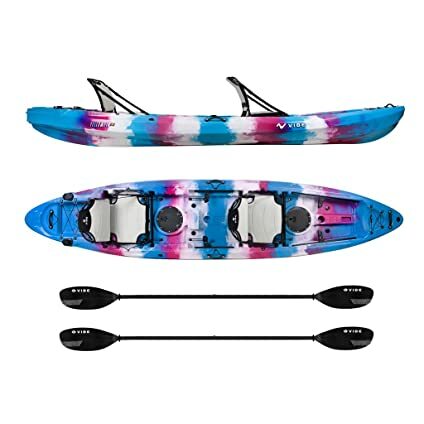 The kayak features a flat hull and defined skegs both in the front and back that helps to track straight while ensuring more comfortable paddling on the open water. You will get a lot of storage options. The center console offers storage, tackle trays and mounts for fish fingers or GPS. You will also get a preinstalled toe controlled rubber system that advanced tracking and paddling. If you want to spend long days on the water, this should be an ideal choice you can make. The Vibe Kayaks Yellowfin 130T comes with rock solid construction. It is built from a single piece of rotomolded polyethylene that makes it rigid and sleek. You will never experience flex in large swells also it never causes a lot of drag in the water. With proper maintenance, this vessel will last for years. The storage capacity of the Yellowfin 130T is fair enough with two storage hatches-one in front of each seat. Also, there is a large cargo deck at the stern of the kayak. 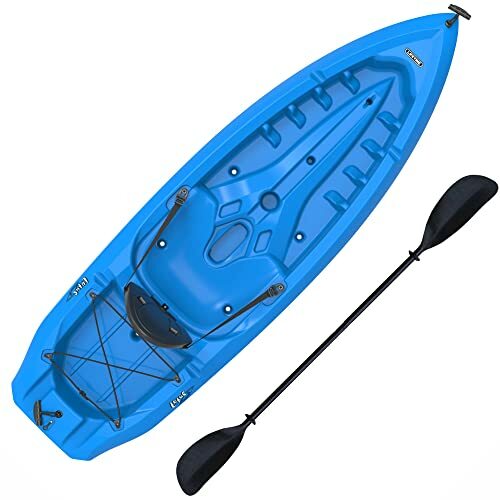 There are two paddle parks, two flush-mount rod holders and four mounting points included in the vessel to make you ready with enough equipment. Furthermore, two paddlers can ride comfortably, and for single paddlers, space is more than sufficient. The seats are adjustable in three different positions. The kayak is 12 feet 2 inches in length with 33 inches of width that makes it stable enough for moderate swells and choppy waters. Therefore, it is easily maneuverable in crowded waters or tight spaces. In a whole, the Vibe Kayaks Yellowfin 130T is the one for every need. The Skipjack 120T is considered as one of the best options for the beginners. This particular Kayak is ideal for one or two people. With four handles it offers a relaxed moment on land as well. The construction quality of the kayak is something beyond your expectation. It is rock solid with quality materials. Durability will never be an issue if you have this one. With proper maintenance, this kayak is everlasting. The Skipjack 120T offers multiple storage options with two seated hatches and built-in cup holders that provide safe housing of smaller objects. The rear cargo area with a bungee tie down straps is ideal for large gears. The pole holders feature four additional mounting options for extra accessories. The seats are comfortable and supportive. 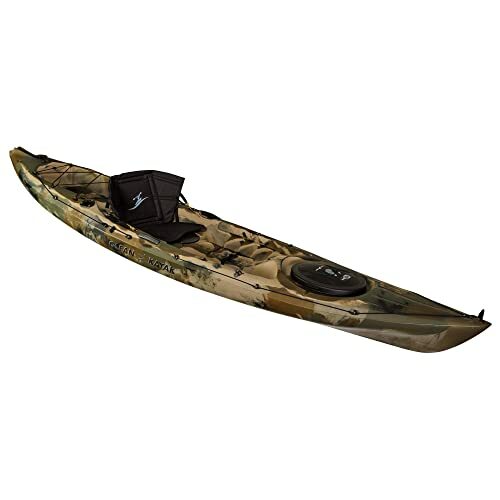 Vibe Kayaks Skipjack 120T offers a maximum of 500-pound weight capacity which is ideal for fishing, travel or family recreation. 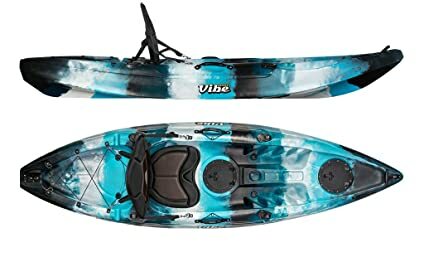 At last, it is one of the best of Vibe Kayaks Company and available at a reasonable price. With premium polyethylene material construction, the Perception Kayak Pescador Pro Sit on Top is another top product of the present time. It is designed to last. This vessel can serve you a lifetime only if you care for it properly. The storage capacity of the kayak is more than enough for keeping a lot of fishing gears and camping equipment. You can even bring both fishing gears and camping equipment for long trips out into the wilderness. With Gear Tac System this kayak seems the smartest in the market. You can easily customize your kayak for this feature. Adding additional accessories including rod holders and electronics will not be a problem. The kayak offers a comfortable seating position, and it is utterly ideal in any weather condition. The price is also acceptable for such quality. I am sure you will love to have it on your next adventure. We all know larger kayaks are great regarding stability and paddling straight efficient lines. Thus we all look for something big. However, when the environment is harsh, space is tight, and you need something fast, a shorter boat will be a perfect choice. The Vibe Kayaks SkipJack 90 is your vessel in that case. It is small, fast and stable with 9′ overall length and only 46 pounds of weight. Similar to the Sea Ghost, the Skipjack 90 gets the highest mark in comfort. The seat is nice with extra padding and convenient adjustability. You will also get multiple storage options. There are three sealed hatches included wit big inserts and large rear tank. All your necessities will stay safe. Concerning portability and stability, this one gets the highest mark as well. The price of the product is reasonable also. Even it is considered one of the best value model of the present time. For making your paddling experience better, hit the link below and ensure your deal. 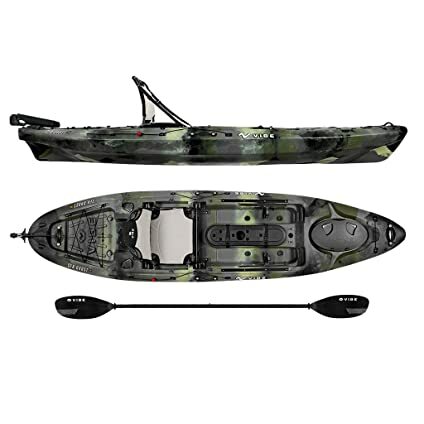 The Ocean Kayak Prowler 13 Angler Sit-On-Top Fishing Kayak is another excellent option for the price. The sensational construction superiority of the product with extreme materials differentiates it with its rivals. At present, it is considered as one of the strongest kayaks in the market that can last a lifetime, obviously with proper maintenance. The Ocean Kayak Prowler Fishing Kayak is 13.4 inches long with 56 pounds of weight. It can hold almost 325 pounds. All of the current users of this product are highly satisfied with the product; thus the negative review is limited on the Amazon. The Kayak is fast, stable and quiet. With four-way-adjustable comfort plus seat, you can paddle all day long. For sure you will get the highest level of satisfaction. Therefore, you don’t have to worry about the storage space as it has sufficient to carry all your essentials. The price of the product is acceptable for such quality. To make your kayaking experience heavenly, pick this one before the stock expires. Ocean Kayak Frenzy Sit-On-Top Recreational is one of the most popular options of the present time. Even according to a lot of current users, it is the best on the market today. People all over the world love this kayak for many reasons. The vessel is easy to use, and you can take anywhere you need. The size and weight of the product are standard and makes it highly portable. The kayak is small and compact, yet it can carry a whole lot of gears. As it is only 9 foot with a 43-pound weight, taking it anywhere is not a problem at all. The built quality of the kayak is good enough for several years of hassle-free use. The seat of the kayak is comfortable. It is ideal for family fun, fishing or just crushing on a calm lake. The Ocean Kayak Frenzy is perfect for people of all ages. The price is not prohibitive as well. The Sun Dolphin Bali SS is 30 inches wide and 12 feet long yet it’s still just 48 pounds makes it one of the most convenient options of the present time. Besides, there are carrying handles included at the front and rear for carrying need. The kayak can hold a vast amount of weight with a maximum capacity of 395 pounds. The Sun Dolphin Bali SS is known as the toughest in the market today with premium polyethylene construction. Even if you drag the board over the ground into the water, the damage will not occur. The product is UV-resistant and also customizable. Easy getting in and out with spacious open cockpit is guaranteed. Padded seat and backrest will let you paddle all day long. The vessel also offers a lot of storage solution. The price of the product is acceptable for quality. Give it a try, and I am sure you will never leave it again. UV-Protected high-density polyethylene construction with firm flat bottom makes it another strong candidate of the present time. For such a fantastic construction quality, this kayak lasts several years. It can serve you a lifetime only if you maintain it properly. Apart from the construction, this product can be praised for several other reasons. It is rich with features that need for professional kayaking. In the rear and center of the kayak, you will get two storage compartments where you can keep every essential item securely. It is fast, stable and ideal in any weather condition. Multiple footrest positions and adjustable seat with pad make it comfortable. 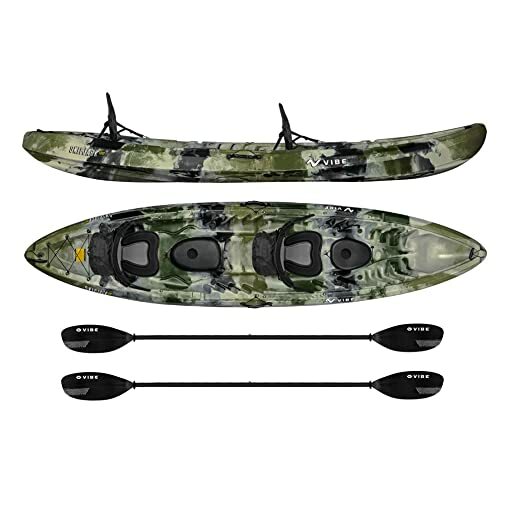 You will also get two flushes mounted fishing rod holders and one top mount fishing rod holder in this kayak. 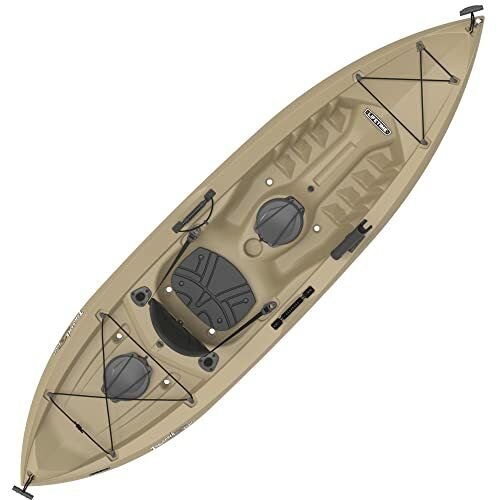 For the price, the Lifetime Tamarack Angler 100 Fishing Kayak is one of the best in the market today. Last but not least, let me introduce Lifetime Lotus Sit-On-Top Kayak, one of the best value model of the present time. 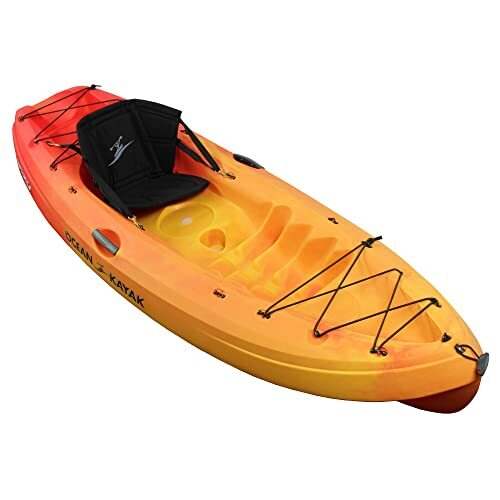 The kayak is made in the USA with high-quality polyethylene material. That means you don’t have to worry about the durability. It will surely serve you a couple of years without any hassle. You will also get multiple footrest positions. No matter whether you are tall or short, you can adjust it according to your need. Even the seat back is adjustable too. The maximum level of comfort is guaranteed. You can keep loose items securely in the tank well with bungee cord lacing. The kayak is fast, stable and lightweight. So, it is easy to carry around as well. Though it is a bit slower in the water, still, for such price, this drawback is ignorable. You need to know about construction materials. Some of the best sit on top kayak are made of fiberglass where some others are made of plastic. Choose according to your need. Overall speed should be your second consideration. Know the length and width accurately. It is crucial as you need to carry the kayak frequently. A lightweight option will make transportation easier. Safety should be your foremost concern. Stability and comfort should be there in the kayak you are going to purchase. If you consider those factors seriously, you will be able to pick the great sit on top kayak for your budget. The market is full of a lot of options. So, we narrow down your choices with the ten most amazing products. Also, to choose the best sit on top kayak from those ten, you shared some important factor with you. I am sure you are ready to hit the market right now. Still, if you have anything else to know, feel free to ask on the comment section. I am wrapping up now. Hope to see you soon with some other essential product reviews.